Valentino Rossi enjoyed another successful qualifying session at the Tissot Australian Grand Prix, delivering his second consecutive front row start with third on the grid for Sunday’s race. The Italian nine-time World Champion was the last rider to leave the pits at the start of the session, waiting to find some clear track. 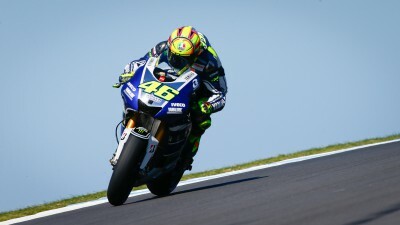 Rossi’s first laps with the soft tyre were enough to put him in fourth position, 0.817 from provisional pole. He then returned to the pits with eight minutes remaining for a quick tyre change and was quickly back out with over six minutes left on the clock. Rossi then put the hammer down and dramatically picked up his pace to put in a 1’28.647 to move up a position and take third on the grid. "Coming back to Phillip Island with the new surface is fantastic," the experienced Italian enthused. "Especially with this weather and this temperature to be back on the M1 is a great pleasure. To be able to push 100% on the soft front tyre is a fantastic feeling. I’m so happy with this position, it's the second first row in a row." "It looks like in the last races we have found a better solution for qualifying because at the beginning of the season I struggled a lot. I know the race is tomorrow and especially Marc (Marquez) and Jorge (Lorenzo) and Dani (Pedrosa) will be very hard to beat. I have to give the maximum, find a good setting and tyre and try to fight for the podium."